wack | I blog for real, y'all bloggers are Sam Bowie. Leaders of the New School…. This is a picture of Lil Wayne sitting court side at the Lakers v Bulls game on Christmas Day. First the Jeggings at the VMA’s and now this atrocity. Rap is about being fly, it always has been. There is NOTHING fly about what Wayne is doing here. He’s not a martian, he’s a clown out for attention. The ONLY dude who could ever pull anything like this off is Andre 3k. Period. Lil Wayne deserves to have both his hood and manhood passes revoked. Between the aforementioned, his face tattoos and a laundry list of other suspect behaviors, Wayne is no longer “misunderstood,” he’s full blown confused with how to live. I’ve never seen a more eligible candidate for a life coach. I hope no other rapper calls him out, b/c it would be a disappointment – the biggest battle Wayne will ever face is with his identity crisis. Next we have Aubrey. With a name like that, he’s been doomed since Jump Street. I will further elaborate my loathing for this individual in an upcoming post. No self-respecting hip hop artist should be playing tennis. Play a sport with some credibility; like basketball, or maybe toss the football around a little. 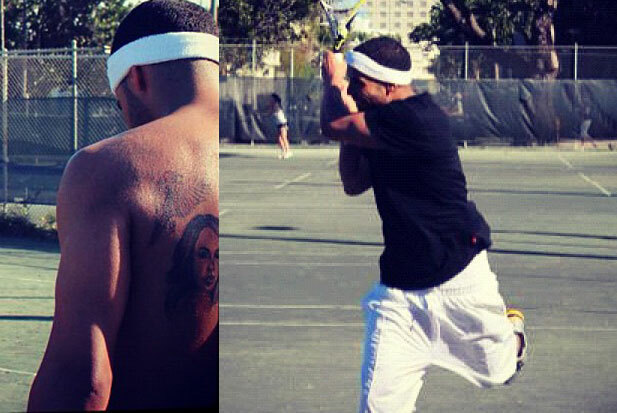 However, if you must play tennis, keep your shirt on and don’t expose your Aaliyah tattoo. I am a fan of Aaliyah as much as the next guy but that doesn’t excuse inking her face on your body. Buy a painting or a sticker. The only men who should be allowed to ink a woman’s face on their body are those who have served prison time. Drake is the antonym of that. In the case that he did get locked up, he would be passed around for enough cigarettes to give every inmate in Rikers lung cancer. The most disturbing thing about these pictures are that these are artists topping the hip-hop charts, winning Grammy’s and are widely excepted as some of the best, most talented people in the industry. I won’t deny that both Drake and Wayne have talent, I just can’t except their lack of masculinity and shame. If this is the direction hip hop is headed, I’ll be listening to the Zeppelin for the rest of my days. At least I can take solace in knowing that some artists can still stick to the code and be men. Common not only dropped the best hip-hop album of 2011, but elaborated quite well on the point I am trying to bring home in his video for the song “Sweet.” Thank you Mr. Common Sense. I will say this, Drake wants no part of Common.